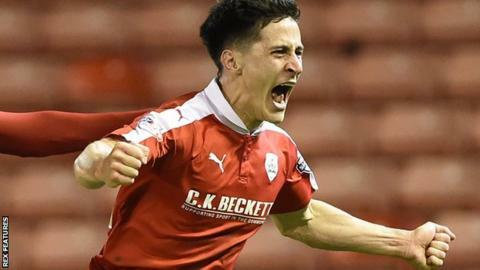 George Williams scored a late winner to secure a vital three points for Barnsley against Peterborough in their pursuit of a League One play-off spot. The win moved Barnsley level on points with sixth-placed Gillingham. Posh were reduced to 10 men when Chris Forrester picked up two bookings in the space of 20 first-half seconds. Ben Alnwick looked to have denied the hosts the win with a string of fine saves before Williams nodded in Adam Hammill's cross with seconds to go. Match ends, Barnsley 1, Peterborough United 0. Second Half ends, Barnsley 1, Peterborough United 0. Corner, Barnsley. Conceded by Andrew Fox. Corner, Barnsley. Conceded by Jack Baldwin. Substitution, Peterborough United. Leonardo Da Silva Lopes replaces Ricardo Santos. Goal! Barnsley 1, Peterborough United 0. George Williams (Barnsley) header from the centre of the box to the bottom left corner. Assisted by Adam Hammill. Ben Alnwick (Peterborough United) is shown the yellow card. Attempt missed. Josh Scowen (Barnsley) left footed shot from outside the box misses to the left. Attempt saved. Harry Chapman (Barnsley) left footed shot from the left side of the box is saved in the centre of the goal. Attempt missed. Harry Chapman (Barnsley) right footed shot from outside the box misses to the right. Attempt missed. Jon Taylor (Peterborough United) left footed shot from outside the box is too high. Corner, Peterborough United. Conceded by Alfie Mawson. Foul by Harry Chapman (Barnsley). Attempt missed. Adam Hammill (Barnsley) right footed shot from outside the box is just a bit too high. Gabriel Zakuani (Peterborough United) is shown the yellow card for a bad foul. Attempt missed. Shaquile Coulthirst (Peterborough United) left footed shot from outside the box is close, but misses to the left. Hand ball by Andrew Fox (Peterborough United). Shaquile Coulthirst (Peterborough United) wins a free kick on the right wing. Attempt saved. Lloyd Isgrove (Barnsley) left footed shot from the left side of the box is saved in the centre of the goal. Corner, Peterborough United. Conceded by Marc Roberts. Attempt saved. Sam Winnall (Barnsley) right footed shot from the centre of the box is saved in the top right corner. Substitution, Barnsley. Ashley Fletcher replaces Ivan Toney. Corner, Barnsley. Conceded by Ricardo Santos. Attempt saved. Jon Taylor (Peterborough United) right footed shot from the left side of the box is saved in the bottom right corner. Lloyd Isgrove (Barnsley) wins a free kick in the attacking half.